GUANGZHOU: The first woman to win a sexual harassment lawsuit against her former boss in this southern city is looking for a new job. The 28-year-old sexual harassment victim, surnamed Luo, was fired before a court ordered her former boss to pay 3,000 yuan ($440) in compensation and demanded the company issue an apology letter three weeks ago. "I still live in a terrible psychological shadow after sexual harassment. I have been turned down for several jobs since the case was brought to court," Luo said. She joined the Japanese-owned Moriroku (Guangzhou) Plastics Company Limited in April 2007. Her nightmare began after a Japanese boss took charge last August. "He began to touch me after he came. I was under great pressure and scared of going to work," Luo said. The boss often snuck up from behind to touch her neck and waist in the office, she said. 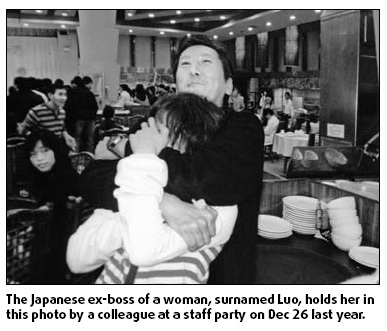 The situation became worse during the company's year-end party on Dec 29 last year. "He came to me after drinking, putting his hands on my breasts. I could hardly struggle to defend myself," she said. Photos showing the boss grabbing her neck and chest at last year's party were shown as evidence in court. Under recommendation of the company's trade union, Luo was later sacked in January after she asked for apologies from the boss and a guarantee from the company to prevent such cases from happening again. "They fired me under the excuse of skipping duties without valid reasons," Luo told China Daily yesterday. However, the federation of trade unions in this southern city is investigating why the company's trade union recommended sacking the sexual harassment victim. Calls to the company's general manager went unanswered yesterday. After being sacked, Luo decided to sue her former boss in March, asking for 400,000 yuan in compensation for suffering mental losses from the sexual harassment. Lawyers and experts said Luo's case could help encourage more women to seek legal assistance to fight sexual harassment in offices, although the company has not yet paid up or issued an apology letter to her. A recent survey conducted by the Guangdong provincial women and children's federation said more than 30 percent of women in Guangzhou had experienced sexual harassment. "In the past, sexual harassment victims often failed to win such lawsuits," said Su Xiaojun, a lawyer with the Guangdong Tiansheng Law Firm. But Luo's case could encourage more victims to bring sexual harassment offenders to court, Su said. "They can't keep silent. Victims should provide as much evidence as possible, such as witnesses and audio or video materials," Su said. As a member of an uppercrust Nigerian family, Umar Farouk Abdulmutallab received the best schooling, from the elite British International School in West Africa to the vaunted University College London. The fallow plots of farmland on the edge of the artists' village of Songzhuang are a symbol of Chinese contemporary art's recent boom and bust cycle. Lady Gaga performs at Nokia Theatre L.A. Live on December 23, 2009 in Los Angeles. Rihanna shops at Saks Fifth Ave on December 22,2009 in Beverly Hills. China's urbanization is lagging 100-years behind the US and could help create sustainable economic development.